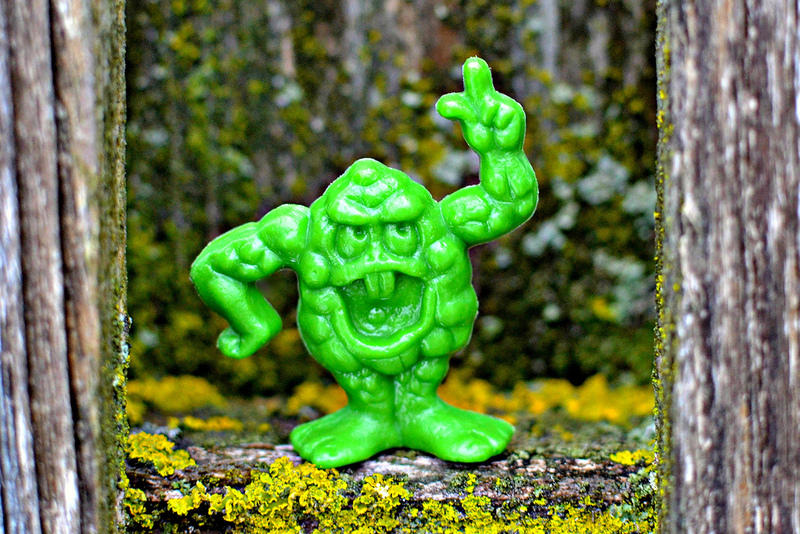 There's been a lot of fantastic toy premiums that came in cereal boxes over the years--especially prior to the 1990s--but the Freakies rank as some of the all-time greatest. I first did a very bare-bones post about Freakies in the early days of this site, but after finally getting the last two figures from the set I needed (shout out to Nik of scary-art.com for helping me out! ), I figured it was time to cover these classic little weirdos in greater detail. Freakies figures came in boxes of a relatively short-lived cereal of the same name. Freakies cereal was produced by Ralston and available in the U.S. from 1972 to 1976. 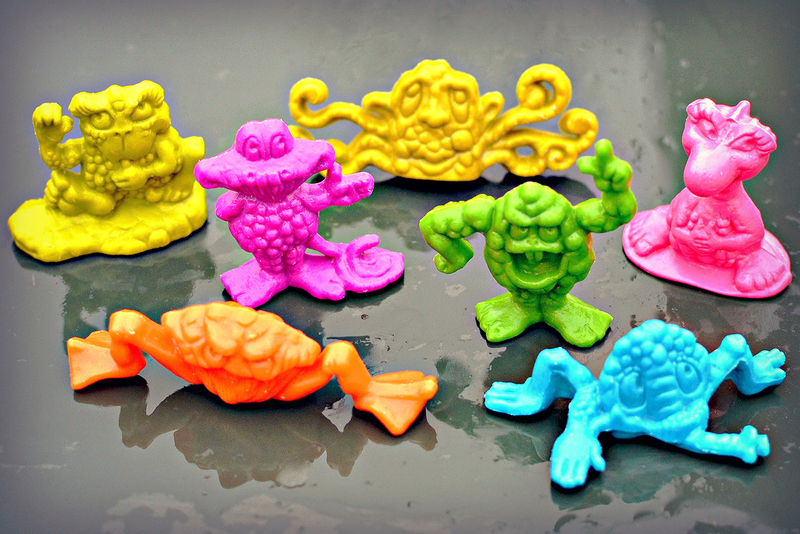 Seven different Freakies figures were made, each in a single color and representing a specific creature from the story that was created to go along with the products. According to the Freakies Wikipedia entry, "in the mythology of the Freakies, the seven went in search of the legendary Freakies Tree which grew the Freakies cereal. They found the Tree, realized the legend was true, and promptly took up residence in the Tree which then became the backdrop for all the TV spots and package back stories." The Freakies were created by Wells, Rich, Greene advertising agency, with Jackie End at the creative helm of the project. There is a site all about the Freakies and their back stories, including a letter from Jackie. Sadly, she passed on in 2012 (from what I could tell, she had been battling cancer). The Freakies characters were called BossMoss, Cowmumble, Hamhose, Goody Goody, Snorledork, Grumble, and Gargle, and each was made to have a distinct personality. We'll take a closer look at them individually below. 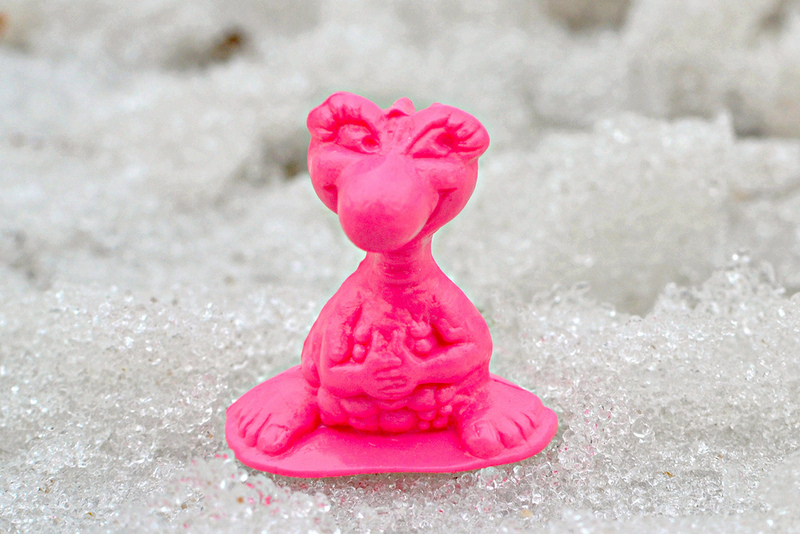 The figures were made of hard plastic, although rarer soft rubber versions in green and orange colors exist. You can see a photo of the rubber versions here. In addition to the figures, other Freakies merchandise was produced, such as patches and toy cars. Here's BOSSMOSS, and just as his name implies, he's the leader of the group. 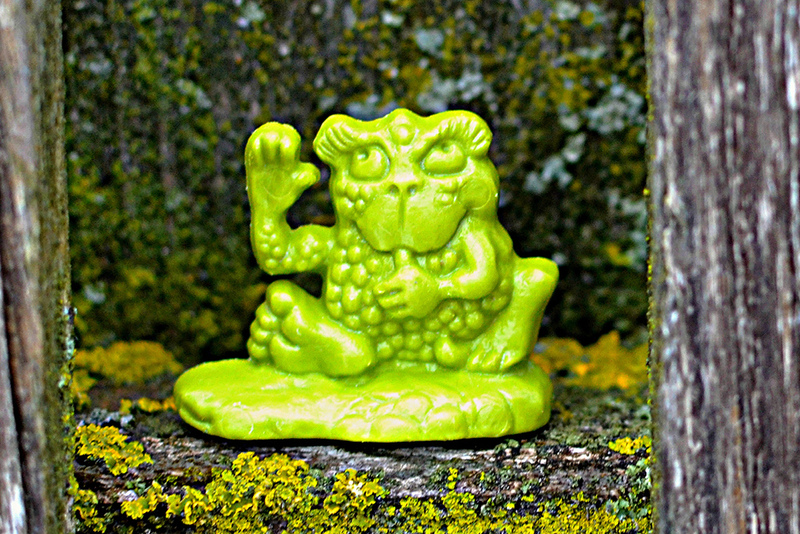 This lumpy, big-mouthed guy was produced in a medium green color and a leader-like pose. GARGLE is the most intelligent of the Freakies. His figure also happens to be one of my favorite sculpts from the set. I love his bumpy body and oddly-shaped head, which kind of looks like a clam with eyes on top of it. I also really like his plum-purple color. 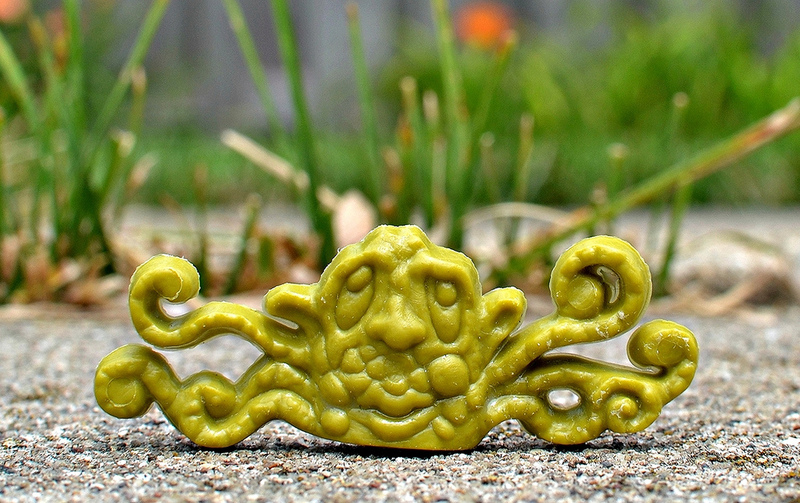 The tentacled HAMHOSE is possibly the most bizarre-looking of all the Freakies. In the background story, he was known as the shyest. While the sculpts of all of the figures deviated somewhat from the cartoon designs of the characters, Hamhose is probably the most different from his two-dimensional inspiration. The figure is much creepier! Pink character GOODY GOODY is one of the two female Freakies. She's the goody-two-shoes of the group. Strangely, while this plastic figure was sculpted with a base, the rare rubber version of Goody Goody has no base. There was also a second unique figure of Goody Goody produced, wearing a fruit hat on her head. It was released in "Fruity Freakies" cereal boxes. GRUMBLE is another really odd one (not that they all aren't odd). 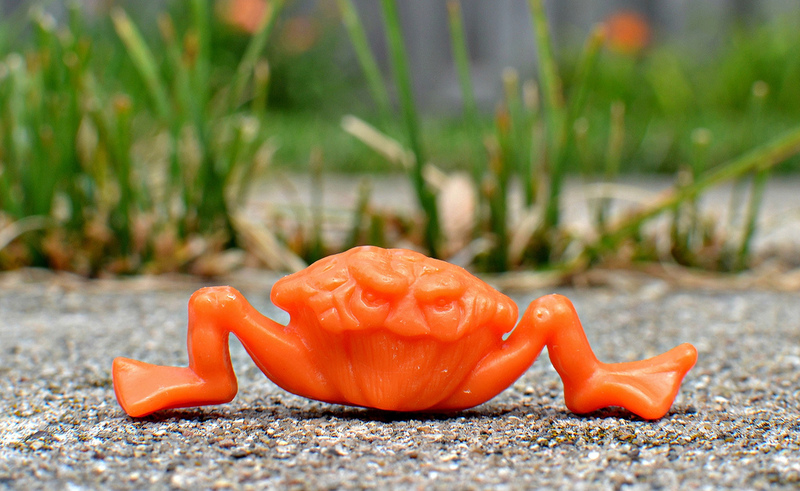 This orange guy is sort of crab-like in his head/body, and frog-like in his legs/feet. His key personality trait is that he's grumpy--sort of the buzz-kill of the group. Another one of my favorites. He just looks so damned cantankerous, and I love that. COWMUMBLE is the second female Freakie. She's supposed to be the kindest of the group. This is an interesting sculpt. I'm not sure if she's supposed to be sucking on her thumb, or what. Also, along with Goody Goody, it's one of the only figures sculpted with a base. Finally we've got the blue guy, SNORKLEDORF. He's the vainest of the Freakies, who thinks he's better looking than everyone else. I guess in Freakie-land, the three-legged blobs with snouts are the lookers. And that does it--all seven Freakies. I'm a big fan of these figures, and the creativity of the characters and overall story in general. I kind of wish I was around when these were in cereal boxes so I could experience the joy of busting open boxes to try to put together a set. What about you? What do you think about the Freakies? These are so weird! I never knew there was such a cereal, before my time. I would love to own some of these, as I am not only a fan of odd mini figures, but I also love cold cereal. I wish I could've tasted the cereal and see for myself if "Freakies is part of a good breakfast". Did you ever find one of the magnets mentioned in the commercial? I found out about them after I got a few randomly in an eBay lot. I didn't know what they were for years. I've never come across any of the magnets or other promo items besides the figures. I was five years old when Freakies came out. A friend of mine had bought a box and brought his Gargle figure over to my house. I was completely enthralled by it and ate nothing but Freakies cereal for breakfast until it disappeared from the shelves four years later. The stories and characters were so creative. Jackie End and company created this magical little world, and they never talked down to kids. The prizes were more like Happy Meal toys than the generic cereal prizes of the day. I'm a grown man, but I still have all of the Freakies cereal prizes -- figures, magnets, cars, boats, airplanes, patches, bike flags, stickers, etc. They revived Freakies in the late 80s and it was an absolute travesty. All of the characters wore Hawaiian-print shirts and rode surfboards through space. Also, they renamed half of them. Goody-Goody became "Hotdog" and Hamhose was "Hugger." It was like the Simpsons episode where the clueless Marketing bozos introduced "Poochie" to the Itchy and Scratchy show to update the concept by being "totally rad" and "extreme to the maxxx." Basically, it sucked. The sad thing is, I'm sure the cereal company's takeaway was that Freakies just didn't have legs, rather than realizing they botched the relaunch by removing everything that made the Freakies special. It was a shame, because the new cereal actually tasted better. 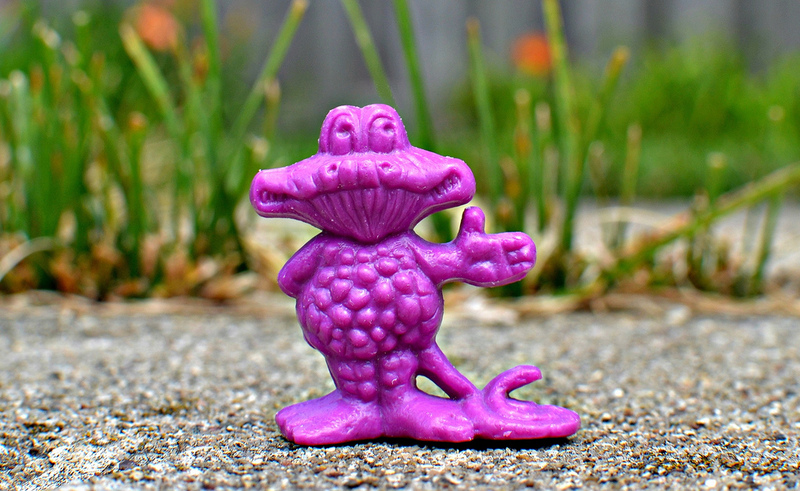 I'm convinced that if they brought back the Freakies again (the REAL Freakies and not the bitchin' rad cosmic skate rats of the 80s), it would be a huge hit with kids, as long as they followed the original formula. Monsters (kids love monsters) + heart (relatable monsters) + awesome prizes (Happy Meal quality Freakies-themed toys) + decent-tasting cereal = profit. It would have to be a labor of love though, and not just cynical marketing. I work for a Marketing agency today, and that's the one account I would love to have above all others. Thanks for your comment! I completely agree. I actually wasn't that familiar with the '80s revival, but you're right, that does sound awful. One of my earliest memories is of Freakies. I must have been three years old when they stopped making them, so I really only had vague impressions. I thought I remembered an octopus in a tree, but didn't think that could possibly be right. And I remembered that we had some of the kitchen magnets. When I was older and tried to figure out what it was, my family didn't remember them and were no help. But a friend of mine and I were just talking about old breakfast cereal mascots and I told him about my vague memory. So we began an online search for cereal mascots and there they were! I'm so glad to have my memory of them fleshed back out a little. It was like visiting old friends. Thanks so much for your post! I love reading other peoples' memories about this stuff. Thanks for stopping by and for your comment! 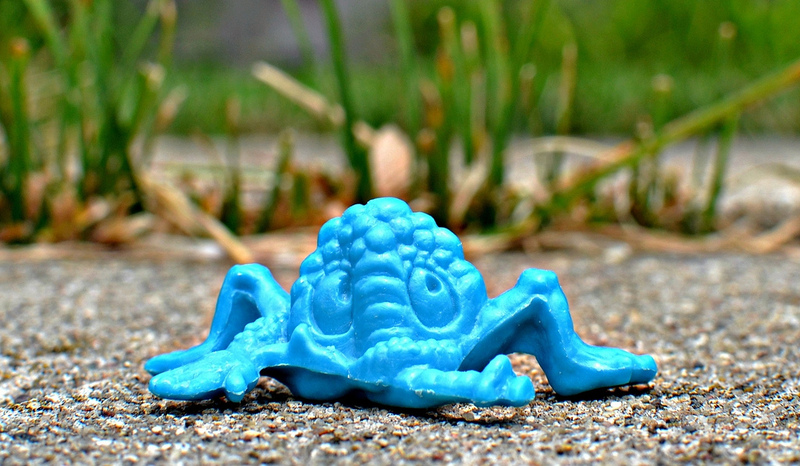 I remember having all the Freakies figures in soft rubber. I don't ever remember mailing for them so I am almost sure they came inside the box. Brings back memories of my childhood. The rubbery ones are worth so much more, too bad you don't still have them! I thought I got mine in the Box two! Are they worth anything? I still have my green and orange rubber collection. In sixth grade, I would make my Mom buy multiple boxes of the cereal, then dig though them looking for the prize. Sometimes I would be disappointed with one I already had. I really got tired of the cereal though. I loved the cereal. My grandmother always bought it for us. We had all the magnets in her fridge. I am looking to buy some magnets to give my sisters as Christmas gifts as a fond reminder of our childhood. Loved it. Loved the toys, the box design, and it tasted good too.